Carlo Azeglio Ciampi (Italian pronunciation: [ˈkarlo adˈdzeʎʎo ˈtʃampi] ( listen); 9 December 1920 – 16 September 2016) was an Italian politician and banker. 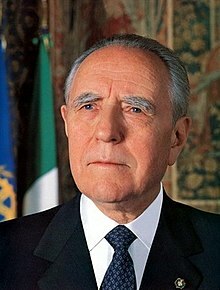 He was the 49th Prime Minister of Italy from 1993 to 1994 and was the tenth President of the Italian Republic from 1999 to 2006. Ciampi was born in Livorno (Province of Livorno). He received a B.A. in ancient Greek literature and classical philology in 1941 from the Scuola Normale Superiore di Pisa, one of the country's most prestigious universities, defending a thesis entitled Favorino d'Arelate e la consolazione Περὶ φυγῆς under the direction of the Hellenist Augusto Mancini. Then he was called to military duty in Albania as a lieutenant. On 8 September 1943, on the date of the armistice with the Allies, he refused to remain in the Fascist Italian Social Republic, and took refuge in Abruzzo, in Scanno. He subsequently managed to pass the lines and reach Bari, where he joined the Partito d'Azione (and thus the Italian resistance movement). In 1946 he married Franca Pilla. That same year, he obtained a B.A. in law from the University of Pisa and began working at the Banca d'Italia. He also joined the CGIL (Trade Union), which he left in 1980. In 1960, he was called to work in the central administration of the Bank of Italy, where he became Secretary General in 1973, Vice Director General in 1976, and Director General in 1978. In October 1979, he was nominated Governor of the Bank of Italy and President of the national Bureau de Change, positions he filled until 1993. Ciampi was the first non-parliamentarian prime minister of Italy in more than 100 years. From April 1993 to May 1994 he oversaw a technical government. Later, as treasury minister from 1996 to May 1999 in the governments of Romano Prodi and Massimo D'Alema, he was credited with adopting the euro currency. He personally chose the Italian design for the 1-euro coin, whereas all others were left to a television vote among some candidates the ministry had prepared (see also: Italian euro coins). Ciampi chose the Vitruvian man of Leonardo da Vinci, on the symbolic grounds that it represented man as a measure of all things, and in particular of the coin: in this perspective, money was at the service of man, instead of its opposite. The design also fitted very well on the bimetallic material of the coin. Ciampi was elected with a broad majority, and was the second president ever to be elected at the first ballot (when there is a requirement of a two-thirds majority) in a joint session of the Chamber of Deputies, the Italian Senate and representatives of the Regions. He usually refrained from intervening directly into the political debate while serving as President. However, he often addressed general issues, without mentioning their connection to the current political debate, in order to state his opinion without being too intrusive. His interventions have frequently stressed the need for all parties to respect the constitution and observe the proprieties of political debate. He was generally held in high regard by all political forces represented in the parliament. The possibility of persuading Ciampi to stand for a second term as President – the so-called Ciampi-bis – was widely discussed, despite his advancing age, but it was officially dismissed by Ciampi himself on 3 May 2006, just a few days before his mandate expired. Ciampi resigned as President before the swearing-in ceremony of his successor, Giorgio Napolitano. As President, Ciampi was not considered to be close to the positions of the Vatican and the Catholic Church, in a sort of alternance after the devout Oscar Luigi Scalfaro. He often praised patriotism, not always a common feeling in Italy because of its abuse by the fascist regime. He died in Rome on 16 September 2016 at the age of 95. 15 June 2005: honorary doctorate by the École Normale Supérieure of Paris. ^ Breda, Marzio (15 July 2009). "Pd avvilente ma eviti scissioni. Sì a Bersani, vero rifondatore". Corriere della Sera (in Italian). La mia ultima tessera […] è stata quella del Partito d'azione, e altre non ne ho mai più volute. ^ East, Roger; Thomas, Richard J. (3 June 2014). "Profiles of People in Power: The World's Government Leaders". Routledge. Retrieved 6 April 2018 – via Google Books. ^ Page at Senate website (in Italian). ^ Favorinus of Arles and the Consolation Περὶ φυγῆς, anastatic reprint by the Scuola Normale di Pisa editions, editor Franco Montanari [it], introduction of Salvatore Settis [it], ISBN 978-88-7642-411-3. ^ Wentworth, Richard L. (28 April 1993). "Italy Turns to a Banker to Form Government". The Christian Science Monitor. Retrieved 26 April 2013. ^ "Carlo Azeglio Ciampi, Former Italian Prime Minister, Dies at 95". The New York Times. 16 September 2016. Retrieved 18 September 2016. Nicola Mancino Minister of the Interior, a.i.